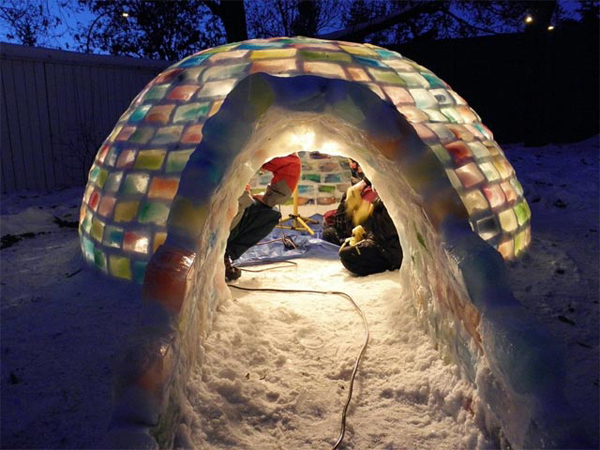 Living in the UK has meant I have had very few snow days in my lifetime, and even though I have attempted to build 2 igloos in the past (half finished due to lack of snow), I’m still determined to finished one eventually – and this amazing rainbow mosaic version is the igloo of my dreams! Milk cartons were filled with coloured water, and then were left to freeze to create ice building blocks in an array of colours. These were then put together to create officially my favourite igloo ever (that’s quite an honour).